No man is an island, as the idiom goes. That’s especially true for bloggers. Once you embark on a creative venture, like building your brand as a blogger, it’s crucial to find like-minded people who understand you – even if they aren’t in the same niche. If you don’t have others to lean on, dream with and scheme with, you could end up stunting your creativity as well as your personal and online growth. This lack of a support system could diminish your true blogger power. I connected with a few established bloggers from various niches, including some from my own network, to talk about how their blogging community has impacted them. In their words, here are 10 reasons to find an inner circle of like-minded creatives for the success of your own blog. 1. It’s a community, not a one-person show. 2. Bloggers form powerful bonds. 3. They inspire new ideas. 4. They teach you how to up your game. 5. They offer the outside perspective you need. 6. They provide long-lasting exposure for your blog. 7. They can help you grow both personally and professionally. 8. Their support is key to building a successful brand and business. 9. They help reaffirm your mission. 10. They empower you to keep going – every day. So how can you build your own inner circle? 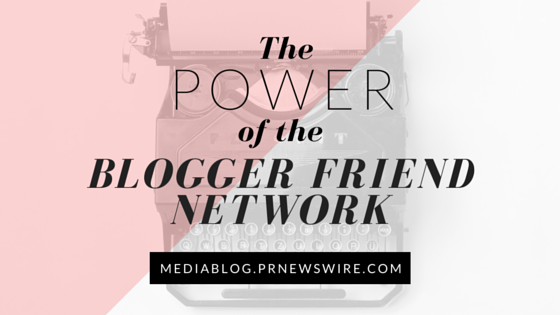 Stay tuned for Part Two on how to unleash the power of the blogger friend network, with tips on how to cultivate your own blogger brain trust.